The Welsh Rugby Union (WRU) plans to open a new luxury hotel next to the Principality Stadium next year. 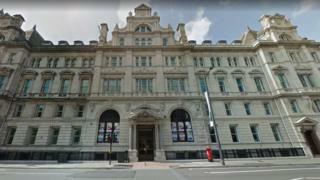 The union has bought a former Post Office and Inland Revenue building in Cardiff for the Westgate Hotel project. The 165-bedroom hotel will include 15 VIP suites, two restaurants, a rooftop spa with an outside whirlpool bath and a ballroom for 400. Subject to planning and listed building consent, construction work will begin in June. The hotel, on Westgate Street, is set to open by December 2020, and is part of an ongoing investment into the regeneration of Central Square. The buildings are to be developed by the Welsh Rugby Union (WRU) in partnership with Cardiff-based property development company Rightacres (RAP) and Legal & General. WRU chief executive Martyn Phillips said: "Principality Stadium is internationally recognised as an iconic destination for rugby and many other sports, music and live events by fans from around the world. "Developing this new hotel will allow us to diversify and supplement our current stadium-based hospitality and conference offering with the additional revenue generated through this business re-invested back into the game at all levels." Paul McCarthy, chief executive of RAP, said the hotel was a "special opportunity to bring activity and vibrancy back into the iconic Post Office building." He added: "Given that this project involves the restoration of a historic building, each guestroom will have its own unique layout with distinct features including the original turrets, eaves, windows and skylight."